Are you ready for another day of My Creative Time sneak peeks? Today we have another fun new set to share with you called Ouch! This set has the cutest bandaid stamps and coordinating dies, as well as lots of get well type sentiments! There are two bandaid stamps in this set, and I think they are just adorable! I took the smaller of the two and stamped it all over a piece of Strathmore Bristol watercolor paper with Versamark ink and then heat embossed it with white embossing powder. I then used my Zig Clean Color Real Brush Pens to color each bandaid, as well as to add some light blue in between them. Once it dried, I trimmed the piece with the largest of the Stitched Rectangular Frame Dies. Next I took one of the Stitched Postage Frame Dies and die cut some black cardstock and a piece of craft foam. I heat embossed my sentiment from Ouch onto the cardstock and then adhered the die cut to the foam piece before adhering it to my card. A variety of sequins finished off this project! Such an adorable card!!!! I love the sentiment... and love the colorful bandaids in the background! So cute! Thanks so much for sharing! This is a happy little get well! OMG Miss Katie...Your card is Totally Super cool and Fantastic. 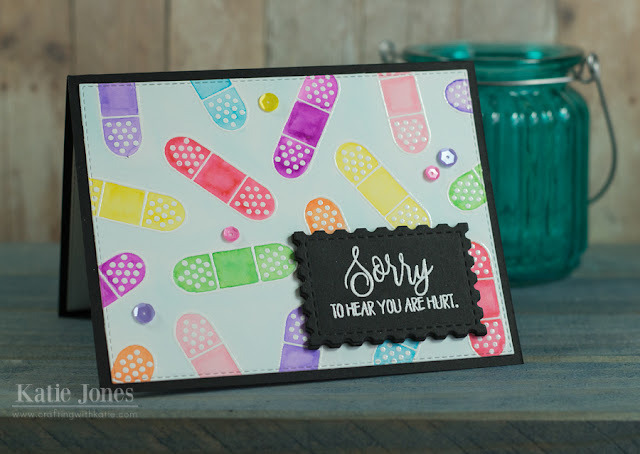 Talk about a Fun & Fashionable owie card..a band-aid to match any outfit...super great ideas for coloring each one...plus your embossing...WOW you so outdid yourself...you truly did a super outstanding creative job...I'm in awe!! YOU so ROCK!! Very cute card, love it! Certainly would make me feel better. Cute! Love the colorful band aids !! Cute card! The colorful bandaids are certain to help make someone feel better. Such a cute card! This new set is a must have for any card maker. LOVE the water colour look!! So pretty, FABBY colours!!! Katie I love love love the extra creativity you put into your card. Love the color of each bandaid. Love how each of you put your own little twist to each project. Great work Katie! This set is adorable and so is your sweet card! Love all of the colorful band-aids. Great job. Love your bright cheery card. Super great new stamp and die set. How cute and cheery with the colorful band aids. Your colourful, cheery band-aides card is sheer delight; sure to lift spirits and spark smiles for people who need some TLC! Love the different colored bandaids. I loVe how you created your band-aid background. Thanks for sharing your wonderful card. I love your coloring background!!! Fun card! Love the bright colored band-aides! OK this stamp and die set is just to cute. I love how colorful background!! You did an amazing job!! What a sweet card. Love all the pretty colors. This set is just fantastic. Wonderful variety of colorful band aids and sprinkling of sequins. I just love your sweet card with pretty colors!! Love your colorful card. Great die and I can't wait to see entire set. Gorgeous background and sweetest get well card ever!